Exercise immunology is an important, emerging sub-discipline within exercise physiology, concerned with the relationship between exercise, immune function and infection risk. 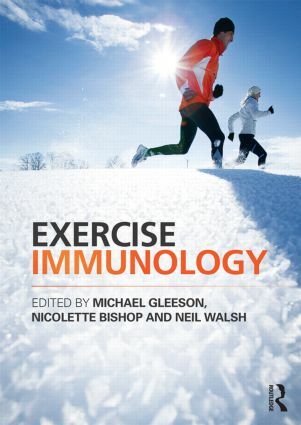 This book offers a comprehensive, up-to-date and evidence-based introduction to exercise immunology, including the physiological and molecular mechanisms that determine immune function and the implications for health and performance in sport and everyday life. Written by a team of leading exercise physiologists, the book describes the characteristics of the immune system and how its components are organised to form an immune response. It explains the physiological basis of the relationship between stress, physical activity, immune function and infection risk, and identifies the ways in which exercise and nutrition interact with immune function in athletes and non-athletes. The book shows students how to evaluate the strengths and limitations of the evidence linking physical activity, immune system integrity and health, and explains why exercise is associated with anti-inflammatory effects that are potentially beneficial to long-term health. Every chapter includes useful features, such as clear summaries, definitions of key terms, discussions of seminal research studies and practical guidelines for athletes on ways to minimise infection risk, with additional learning resources available on a companion website. This is an essential textbook for any course on exercise immunology or advanced exercise physiology. Michael Gleeson is Professor of Exercise Biochemistry at Loughborough University, UK. Over the past 20 years he has published over 150 papers on exercise physiology, biochemistry and immunology and sports nutrition. He is a member of several Sports Science societies in the UK and worldwide, as well as being a past president of the International Society of Exercise and Immunology. He is also an elected Fellow of the European College of Sport Science, a past editor of the Journal of Sports Sciences and is currently associate editor of Exercise Immunology Review. Nicolette Bishop is Senior Lecturer in Exercise Physiology at Loughborough University, UK where she leads the Performance Health Research Theme within the Peter Harrison Centre for Disability Sport. She is widely published in the area of exercise immunology, is a member of the International Society for Exercise and Immunology, a Physiology Advisory Board Member for the Journal of Sports Sciences and acts as a consultant for the English Institute of Sport. Neil Walsh is Professor, and Director of the Extremes Research Group, in the School of Sport, Health and Exercise Science at Bangor University, UK. He is physiology section editor for the Journal of Sports Sciences, and a full member of BASES, the Physiology Society, the International Society of Exercise and Immunology and the American College of Sports Medicine.